U.S. Marines marching in Danang, Vietnam, March 15, 1965. Photo courtesy Associated Press. “If we live long enough, we may even get over war.” —Maya Angelou. I graduated from high school in 1965 and college in 1969. The relentless war in Vietnam fueled an escalating war on the streets of our inner cities and college campuses; heroes were assassinated; politically-empowering music flooded the airwaves and footage of war and anti-war skirmishes saturated the Six-O’Clock News. Civil Rights activists and anti-war protesters, conscientious objectors and draft-card burners captured the headlines of the day. A substantial number of young men from my generation were drafted and annihilated in a war that bore no resemblance to the war our fathers and grandfathers fought in WWI and WWII. Anger, fear and hate drove Americans out of their post-WWII happy place. I thought I understood what was going on and why, but I was young and naive. As it turned out, most Americans were grossly misinformed about the senseless war in Southeast Asia and the Vietnamese culture and landscape that we were eviscerating. On May 7, 1985, during my lunch break as a gainfully employed adult, I stood in a crowd in lower Manhattan and watched a ragtag procession of Vietnam veterans march through the “Canyon of Heroes.” What can you say about the walking wounded? It was too little too late, and it was heartbreaking. 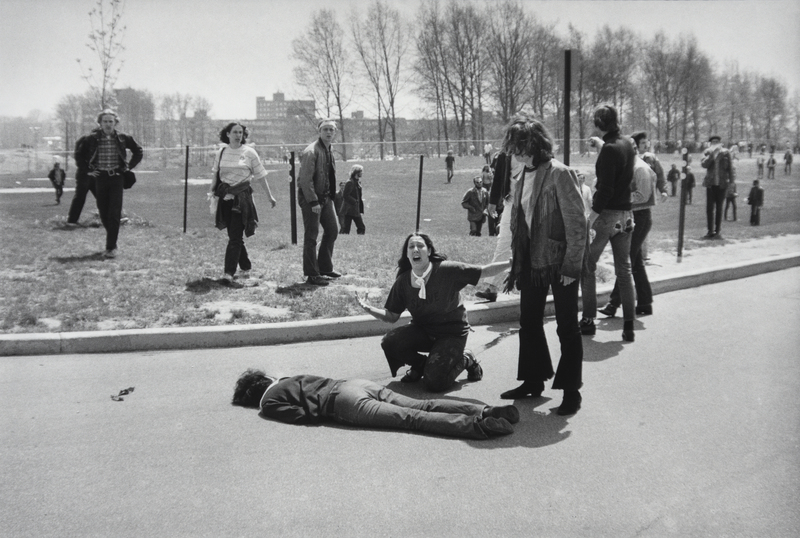 Mary Ann Vecchio kneels over the body of fellow student Jeffrey Miller, who was killed by Ohio National Guard troops during an anti-war demonstration at Kent State University on May 4, 1970. Photo courtesy John Filo/Getty Images. As time passed, I reviewed some high-profile films about the Vietnam War, including one by my friend, Academy Award®-winner Terry Sanders, about the struggle to justify and design a suitable national monument honoring our Vietnam War vets. But soon, the war faded from the news, and the film community, the country and I moved on… that is, until I previewed The Vietnam War, the powerful new 10-part, 18-hour PBS series directed by Ken Burns and Lynn Novick. I couldn’t help but see the parallels between then–the secrecy, lies, “fake news,” and mindless meddling and military intervention in cultures alien to our own –and now. Geoffrey C. Ward was born in Newark, Ohio, and grew up on the south side of Chicago and in New Delhi, India. He’s been the sole or principal scriptwriter for Ken Burns’ Huey Long; The Statue Of Liberty; Thomas Hart Benton; The Civil War; Empire of The Air: The Men Who Made Radio; Baseball; The West; Thomas Jefferson; Frank Lloyd Wright; Not For Ourselves Alone: The Story of Elizabeth Cady Stanton and Susan B. Anthony; Jazz; Mark Twain; Unforgivable Blackness: The Rise And Fall Of Jack Johnson; The War; Prohibition; and The Roosevelts: An Intimate History. Ward also wrote or co-wrote companion volumes for seven of those series. To date, he has two Writers’ Guild Awards, seven Christopher Awards, and six Emmy Awards on his mantle. 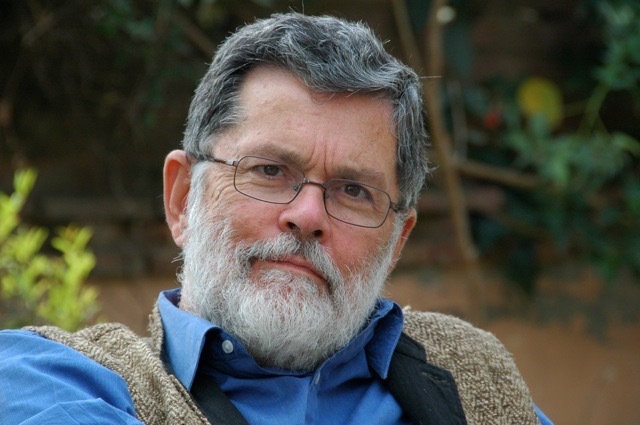 An independent historian and biographer, Ward has penned six other books, including A First-Class Temperament: The Emergence of Franklin Roosevelt (Harper & Row, 1989), which received the National Book Critics Circle Award and a nod from The Los Angeles Times for best biography, the Francis Parkman Award from the Society of American Historians and was a finalist for the Pulitzer Prize. I first connected with Geoffrey C. Ward during my 11-year stint as the Director of The Christopher Awards. He was a perpetual Christopher Award winner for his work with Ken Burns, for whom he most recently scripted The Vietnam War series. Geoffrey graciously agreed to share his take on the project and subject with me. Author/historian/screenwriter Geoffrey C. Ward scripted the entire 18-hour PBS series,THE VIETNAM WAR, directed by Ken Burns and Lynn Novick. Photo: Diane Raines Ward. Judith Trojan: You have collaborated with Ken Burns as the sole or principal screenwriter of his films since 1984. Whose idea was it to produce a series about the Vietnam War? Geoffrey C. Ward: I honestly can’t recall whose original idea it was. Whoever it was, we all jumped at it. Trojan: You’re credited as the sole writer on The Vietnam War series, which is 18 hours long and is broken down into 10 episodes. That’s an extraordinary mountain to climb, given the scope of this project. Would you say that The Vietnam War is the most complex and difficult project you’ve tackled for Ken? Did you have any reservations about revisiting such a painful chapter in U.S. history? Ward: Ken specializes in lofty mountains. This was by far the highest I’ve had to scale. I didn’t have reservations, but I did have concerns about the sheer size of the literature I’d have to mine.The script and the companion volume took more than five years. I was writing furiously till early this year – and am still recovering. 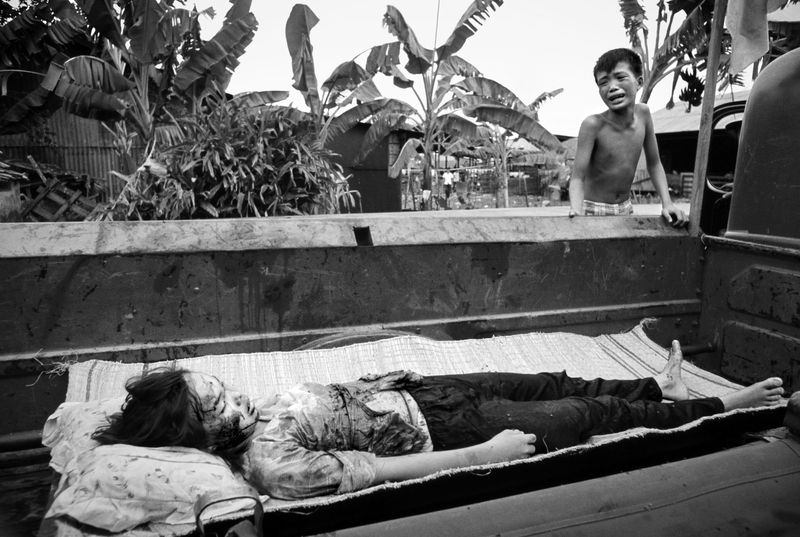 This 12-year-old girl was killed in the May Offensive (Mini-Tet) in Saigon, 1968. The Saigon fire department had the job of collecting the dead from the streets during the Tet offensive. They had just placed this child, killed by U.S. helicopter fire, in the back of their truck, where her distraught brother found her. When The New York Times published this photograph, it implied there was no proof that she was killed by American firepower. Photo courtesy Philip Jones Griffith/Magnum Photos. Trojan: The series’ pitch line–‘There is no single truth in war’–is an understatement. The film brilliantly interweaves remarkably honest recollections from American and North and South Vietnamese combat veterans, medics and nurses, Gold Star families, POWs, conscientious objectors, deserters, anti-war activists, and civilian participants who served as aid workers, government staffers, spies and photojournalists. Did you meet and interview every one of those individuals as you were writing the script? Ward: Lynn Novick, the co-director and producer of the series, conducted the bulk of the interviews, both here and in Vietnam. My job was to plug them into the story we were trying to tell. Trojan: Did anyone stand out to you as pivotal to the series? Ward: I have a lot of favorites, but one stands out–John Musgrave, who went to the war as a gung-ho Marine and ended up marching in the streets to stop it, and was equally patriotic, early and late. Trojan: Other than photojournalists who worked the Vietnam beat as young men, the film does not feature talking head historians, pundits or politicians, which I found to be refreshing. You focus on subjects who actually had their boots on the ground, lived to tell about it and currently have no political ax to grind. 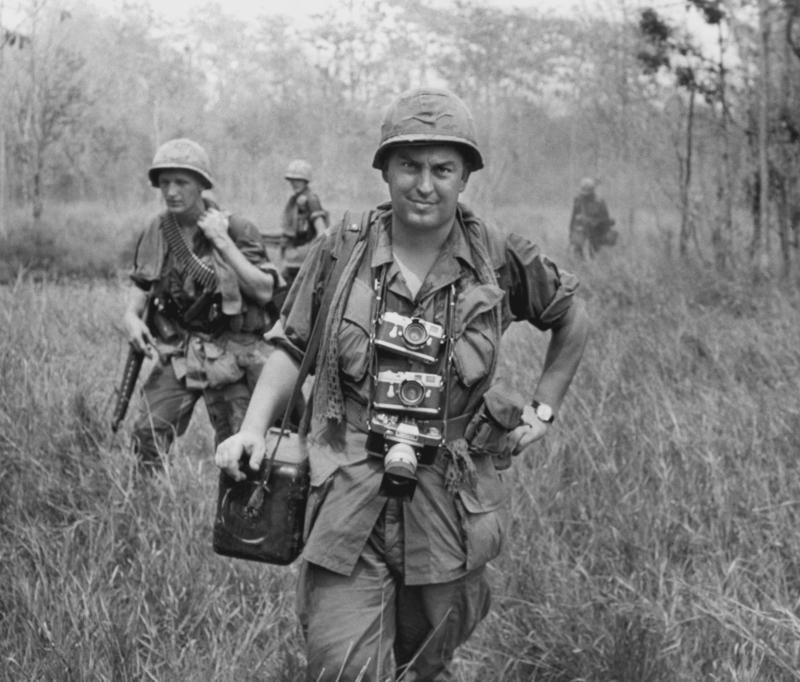 Horst Faas, Associated Press Chief of photo operations, with his Leica cameras around his neck, accompanied U.S. troops in War Zone C, Vietnam, circa 1967. Photo courtesy AP/Horst Faas. Ward: Leaving out historians–and surviving statesmen–was a mutual decision. Since so many witnesses were alive and willing to talk–on all sides of the conflict–we wanted them to own the series. No ‘experts’ needed to apply–though we had an extraordinary panel of scholars whose counsel we took very seriously. Trojan: I was astounded and moved by the willingness of South and North Vietnamese veterans and civilians to share their honest and often painful recollections of the war that decimated their homeland and civilian population. Can you explain the difference in allegiance between the men and women who served in the North Vietnamese army and the Viet Cong soldiers? Were both groups committed to the Communist line? Ward: Both saw themselves as Vietnamese patriots – as did their South Vietnamese opponents. The National Liberation Front forces–called the Viet Cong by the Americans–were southerners who claimed always to be acting on their own but were actually directed by the North Vietnamese, who also sent tens of thousands of regular troops southward to join the struggle. 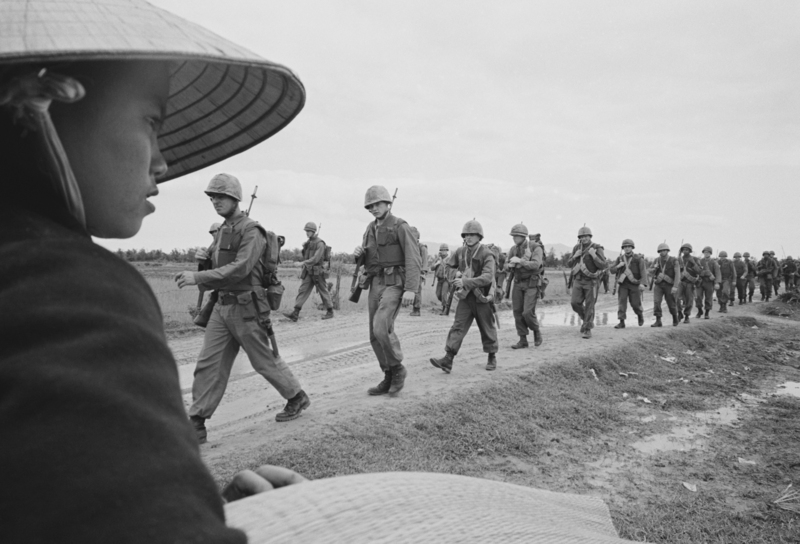 We make it clear that the Vietnam War was a civil war as well as an international conflict. 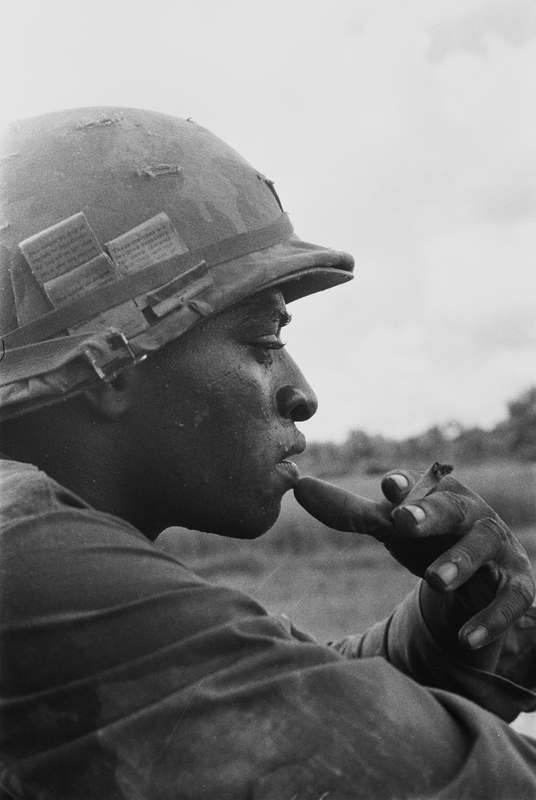 A soldier in the 25th Infantry Division, Vietnam, circa 1969. A disproportionate number of African-Americans were drafted, shipped overseas and ended up as casualties during the Vietnam War. Photo courtesy Charles O. Haughey. Trojan: I especially appreciated the backstories spotlighting the courageous sacrifices of Native-Americans, Japanese-Americans, African-Americans, Hispanics and women during the Vietnam War, on the battlefield and stateside. Were you all on the same page about insuring that you covered all bases? Ward: I think we did a good job of conveying the diversity of our military, not because that was the politically correct thing to do, but because it was historically accurate. Trojan: Vietnam and anti-war footage was a stomach-churning condiment during dinnertime newscasts at the time. Often, the carnage was just too gruesome to swallow as we chowed down on our Swanson TV dinners. Revisiting that footage in your film series is tough; it makes staged action in docu-dramas look tame. The photojournalists and TV newscasters who originally filmed and reported on that footage as they accompanied our troops into battle and dodged bullets and billy clubs on our burning streets and college campuses, were either incredibly brave or stupid. But we owe them a debt of gratitude for reporting and filming the truth. Any reservations about how much of that footage to include? Ward: Reading about warfare is one thing. Looking at it straight-on is another. Horror can overwhelm. We used the footage judiciously. For every bloody scene we included, there were scores more we might have chosen. It’s no accident that, after Vietnam, censorship was imposed on our adventures overseas. TV crews were not allowed to show as much combat during the Middle Eastern wars. Journalists are embedded in specific units rather than being allowed to roam more or less freely, as they did in Vietnam. 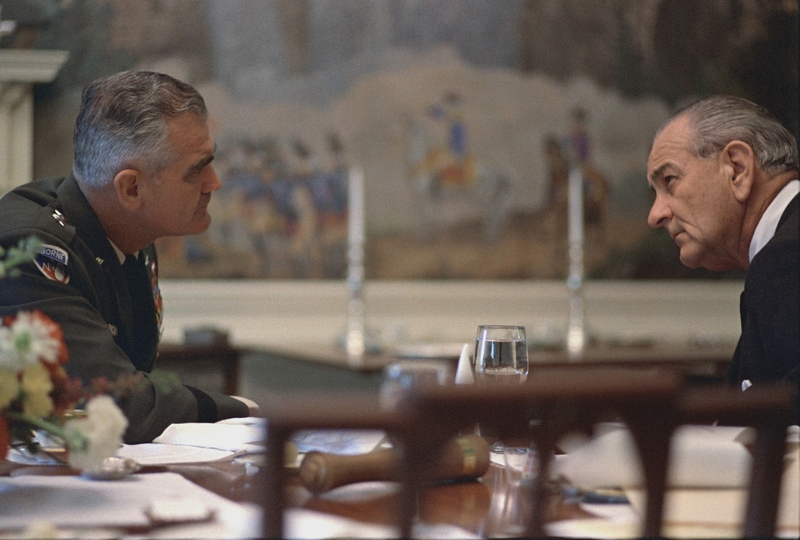 General William Westmoreland and President Lyndon B. Johnson, April 4, 1968. Photo courtesy Lyndon B. Johnson Presidential Library, Audiovisual Archives. Trojan: How did you and your team come by the audiotapes of conversations and phone calls between LBJ and McNamara, also Eisenhower and Nixon and Kissinger? They are riveting indictments of the White House players. Ward: A whole generation of scholars has labored to listen to those remarkable tapes, and we were lucky to be able to draw upon their gleanings. They do not provide a picture of forthright, resolute leadership, and it’s no accident that no president since Nixon has allowed such damning recordings to be made. Trojan: I was astonished to hear their conversations and the anti-Communist rhetoric that denigrated protesters and our Vietnamese allies. LBJ comes across as a whip smart but tortured President whose landmark domestic legislation was clouded by his failed foreign policy. It’s hard to believe that Nixon’s backstory could get any worse, but it does here. Secrets and lies seem to have been the order of the day. Do you see any parallels with what’s going on in our country today? Ward: History doesn’t precisely repeat itself – or at least I don’t think it does. But it does chime. It was American overconfidence and ignorance about the rest of the world that got us into such trouble. I’m afraid those same weaknesses are alive and well in 2017. 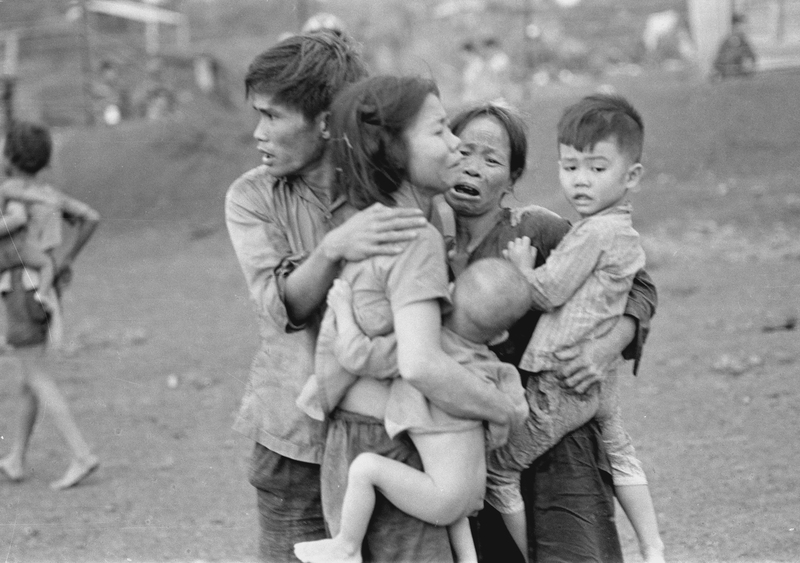 Civilians huddle together after an attack by South Vietnamese forces, Dong Xoai, June 1965. Photo courtesy AP/Horst Fass. Trojan: One of the things that touched me is a remark from a Vietnamese veteran who remembers when he had an epiphany about American soldiers being human beings, because they never failed to risk life and limb to get to their wounded and dead comrades and transport them out of harm’s way. In contrast, several American vets recall the pressure they were under to grow the enemy body count, which explained why they quickly devolved from the ‘boy next door’ to killing machines who were forced to objectify the enemy and rationalize civilian collateral damage. How would you define the word ‘hero’ in the context of this frightful war? Ward: The Vietnam War produced a host of heroes on the battlefield, heroes who sacrificed themselves for the benefit of their fellow soldiers. The war also yielded heroes who never heard a shot fired in anger but who were willing to sacrifice themselves in the interest of peace. Released POW, Lt. Col. Robert L. Stirm, is greeted by his family at Travis Air Force Base, March 17, 1973. Photo courtesy AP Photo/Sal Veder. Trojan: What is your most important take-away from The Vietnam War series? Ward: The most important take-away for me is simple: Do not go adventuring abroad without understanding your enemies — or your allies. Trojan: What about working on a ‘Ken Burns film’ makes you want to continue? This entry was posted in Film, Journalism, Newspapers, Photography, Politics, Publishing, TV and tagged Dwight D. Eisenhower, Geoffrey C. Ward, John F. Kennedy, John Musgrave, Ken Burns, Lyndon Baines Johnson, Lynn Novick, PBS, Richard M. Nixon, The Vietnam War, U.S. Presidents, Vietnam, War. Bookmark the permalink. Judy, thanks so much for your inciteful comments on Vietnam series and your interview. I, also grew up about same time frame as u thought I understood what was going on but realize there was so much more going on. Thanks again Judy, so enjoy all of your blogs. Thanks so much, Carol! It’s a brilliant series and I’m so appreciative of Geoffrey Ward’s participation.